1. Cabinet size : 3’ x 3’ x 3’ made of 5mm sheet. 3. Pressure Vessel : 200Kg. Capacity. Available in 3 cabinet sizes. Accomodates accessories like conveyor for long jobs or Rotary table in cabinet. Ideal for Moulds, Pressure Diecasting, Piston Rings etc. We bring forth vast industrial experience and expertise in this business, involved in offering a high-quality range of Wet Blasting Machine. 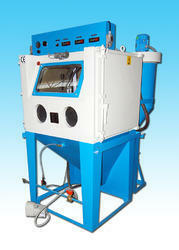 Owing to the presence of our expert team members, we are able to offer a wide range of Wet Blasting Machine. Our company holds vast experience in this domain and is involved in offering Wet Blasting Machine. DEN SIN Water Blasters, 550 Bar, each capable of blasting 150 m2/hour.